Embrace the cultured look of Italian design with the refined Gallinari end table. A shapely cast iron base emanates Gothic style, while the marble and glass top recalls the textural and earthy tones of the Italian coast. 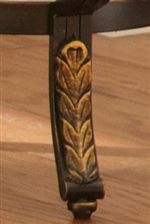 Brass finished foliage accents decorate the legs, adding that extra bit of polish for a truly luxurious appearance. Transport yourself to the coast of Italy when you decorate your living room with the Gallinari end table. 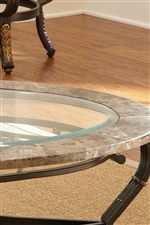 The Gallinari Round End Table with Glass Top by Steve Silver at Walker's Furniture in the Spokane, Kennewick, Tri-Cities, Wenatchee, Coeur D’Alene, Yakima, Walla Walla, Umatilla, Moses Lake area. Product availability may vary. Contact us for the most current availability on this product. 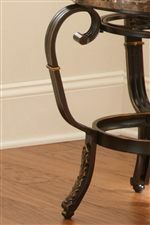 The Gallinari collection is a great option if you are looking for Traditional furniture in the Spokane, Kennewick, Tri-Cities, Wenatchee, Coeur D’Alene, Yakima, Walla Walla, Umatilla, Moses Lake area. Browse other items in the Gallinari collection from Walker's Furniture in the Spokane, Kennewick, Tri-Cities, Wenatchee, Coeur D’Alene, Yakima, Walla Walla, Umatilla, Moses Lake area.